Club Penguin Cheats by Mimo777 Club Penguin Cheats by Mimo777: Club Penguin "Green" Reviewed By You! "Me and my buddies always check out anything new on the island! We love to explore new rooms and play new games! We think the new outfits rock and we always wear them, especially the Green Hard Hat and the green suit with the water hose! It's so much fun, I never ever want it to end! Waddle on Club Penguin!" 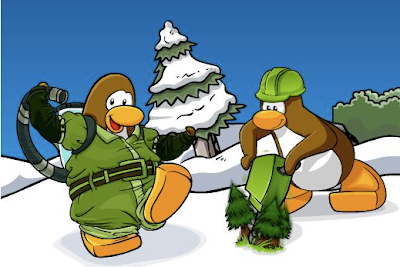 Next week, Club Penguin wants to know what you are doing in your home to celebrate Earth Day! I think I will plant a garden on my roof while eating green pudding! How 'bout you? I will eat green waffles whilst sitting on fluffy green marshmellows...lol! i'd ummmmmm... quit tv? lol i dont watch tv anyway..
Me neither! Let's keep our eyes out for the party post B-) haha. Hmm someone on the news today had a garden on Their roof. Strange. Well, I cant wait til your party see you there. Im gonna plant some herbs on my windowsill then maybe use your idea and eat green pudding, sounds delicous! And i will also wear green in the spirit of earth day. lol guess what i use for my bunny's litter recycled new papers rolled up its called Yesterdays News lol get it? i'll not do homework on paper! hehe..um i guess i could use plant a flower or some plant..and use less plastic..and something like that. I can't wait until the party! Well mimo, everything I eat will first be dyed in green food coloring then rubbed on grass then sprayed with green spray paint! and i`ll turn off all the lights in the house to prevent the global warming :). All people from all the world should do that at least 1 hour! well, does eating green pankakes count? HAHA! LOL, good idea except that Earth day is also Take your child to work day! At my school we have and Earth Day celebration and no school! Plus, im going to take your child to work day! No homework for me! I am annoyed that they are on the same day! Its so hard to decide which to go to! Hey guess what? Most of the world does do that! Just in April! For 60th Earth hour! I do think we should do that more! Green pudding?? ?Where do you come up with this??? You know,i've seen green pudding in Diseny World before!I did not get it because i was to stuffed with french fries to eat any thing else. Hey Mimo! Can you give me credit because you forgot to tell them that this picture shows the man with the drill and he is drilling trees! Remember a long time ago there was a poll on Clubpenguin saying a question like, 'What should come out of the drill now' and people voted for something and now it shows it the anser! Bye Mimo! That's very interesting. Oh, and you can only put "CPG Mod" when you're actually Modding! That's a neat idea! I'll do that, too! It might depend on the pancakes - try grass pancakes or something. Well... of course it counts. You are eating, like the greatest food ever, and its green. Rock on! Mimo, Since Club penguin is getting is getting green, and Herbet wants it to be warmer, Herbet might polloute Club penguin to make it warmer! This might not be the same but since st. patricks day is green and earth day is green. We could replace st. patricks day with earth day. Lets have a green pudding party! We can play pudding games and eat pudding all night! The water suit thing looks like a ghostbuster outfit!